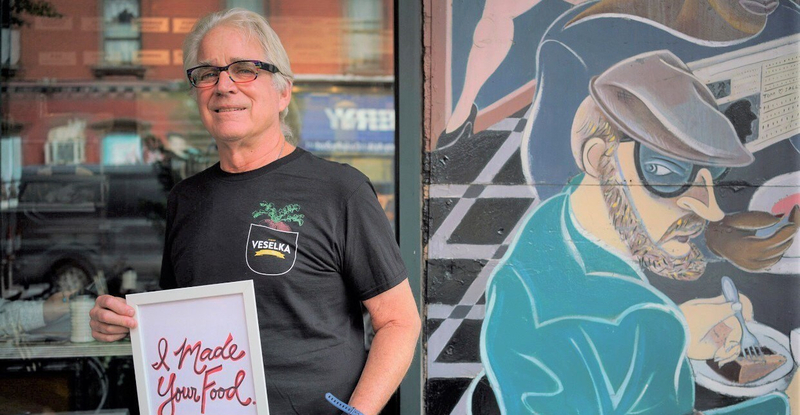 This is Tom Birchard, the owner of Veselka, and the son-in-law of Wolodymr Darmochwal, the original owner who founded the East Village landmark in 1954. Although their menu is now full of rich, authentic Ukrainian and Polish dishes, when the store was first purchased by Wolodymr, it operated as a candy store/newsstand with a small lunch counter and a limited menu of soup and sandwiches. It wasn’t until Wolodymr asked a few women from the neighborhood to come to the store at night and cook him some simple, homemade Ukrainian dishes that the newsstand began to evolve into a restaurant. These dishes were supposed to be for Wolodymr to eat as he worked but he began sharing them with customers and then, when he noticed how much they loved them, he began selling them. And the menu that Veselka is known for today was born. Wolodymr always had an entrepreneurial spirit and an interest in the food industry. He was a middle manager at an agricultural co-op in Ukraine before World War II started and he and his wife were forced to flee to a displaced persons camp in Germany. After the war ended, they were re-settled in New York and moved to the East Village because it was a predominantly Ukrainian neighborhood. A lot of people from Ukraine and Poland had settled there after World War I and had established banks, churches, coffee shops, etc., creating a community reminiscent of the homes that they had lost. Both Wolodymr and his wife started working menial jobs when they arrived in New York but in this new home he saw an opportunity to become an entrepreneur. He had always wanted to own his own business and had management experience in food, so when he saw the small shop on 2nd Avenue for sale, he took the little money he had saved and bought it. Tom was introduced to Wolodymr, Veselka and the East Village in 1966 by Wolodymr’s daughter, Marta, who he had met at a frat party at Rutgers University in New Jersey, and would later marry. Although he didn’t know anything about the East Village or Ukrainian food, he immediately fell in love with the neighborhood’s energy and diverse people as well as the ethnic food that was an intrinsic part of his new family. Tom began working for Wolodymr and saw the potential to turn Veselka into a larger operation. They purchased one of the adjoining storefronts on East 9th Street and made it into a dining room, working together closely before Wolodymr’s sudden passing in 1975. After his death, Tom took over the business and ran it as a diner/luncheonette until they were able to do a major expansion in 1996 and turned Veselka into the East Village institution it is today. As Veselka has expanded over the years, Tom has made sure that they keep the traditional feel of the restaurant, keeping the original tin ceiling and wood paneling, so that customers don’t feel like the character of the establishment has been lost. For him, it’s been the most challenging part of the business but he understands the importance of balancing the old and the new, because so many customers can trace some part of their heritage back to Eastern Europe and have a strong emotional connection to Veselka and the style of food that they serve. Which is why it’s also important to him to be respectful to the original recipes that he says get more and more popular each year. The homemade, traditional Ukrainian and Polish dishes that his father-in-law started off serving (beef stroganoff, borscht, stuffed cabbage, pierogis) are still the best selling items on the menu, all of which are made from scratch. They have a team of 4 full time Polish and Ukrainian grandmas making pierogis by hand 5 or 6 days a week, making 1,500-2,000 pierogis a day and 2,500-3,000 a day during the holiday season. According to Tom, one of the best compliments that they consistently get is “your food reminds me of what my grandmother used to make”. Veselka has become a refuge for many, for its inclusive atmosphere and for it’s simple, honest, filling, good food that they work very, very hard to create. And that is the charm of Veselka- it blends generations of people together, capturing the essence of Eastern Europe in a modern setting: the heart of New York City. It was founded to be a piece of home for a displaced, immigrant community and continues to be one today for customers that are looking for a connection to their ancestors. Even more so, it has become a melting pot, serving customers from all walks of life and employing an incredibly diverse staff of Ukrainian, Polish, Bangladeshi, American, Tibetan, Latin, Mexican and Ecuadorian men and women. With over 100 people working there around the clock (Veselka is open 24/7), it has become a big family, where, regardless of where you come from or what language you speak, everyone gets along, becomes friends and feels at home. Previous Entry:Fall Parties You Can Host at the Office!